In London maximising your space is imperative, and our clients wished to extend their rear single storey building to the full width of their plot. They also wished to add a much needed fourth bedroom as well as re-arrange the space to create a Master bedroom suite to the loft with an En-suite. 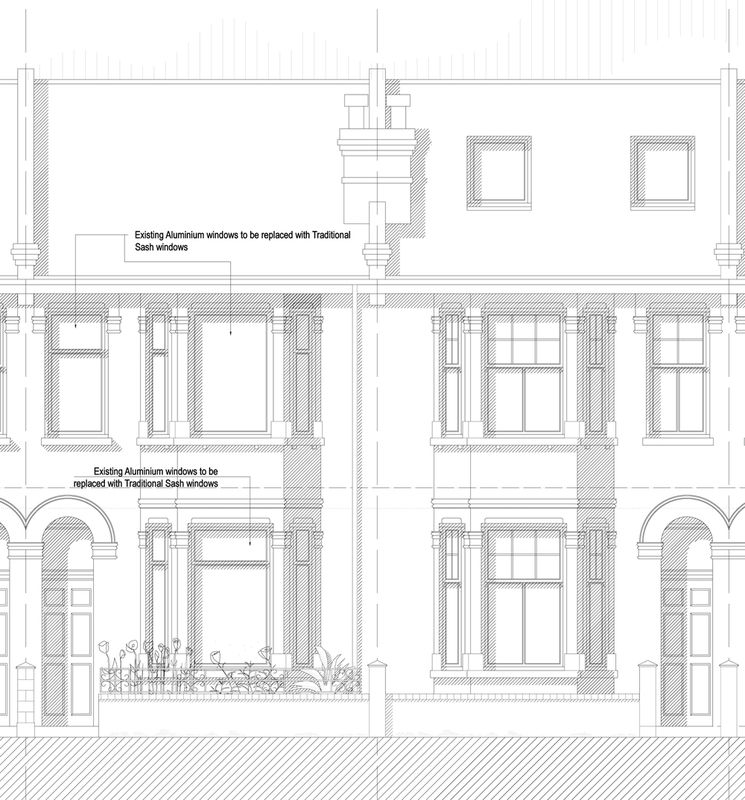 Soon after they decided to complete these alterations, a new neighbour arrived and they also wished for alterations to their property in a similar manner, and it was decided to complete a joint application for the proposals. 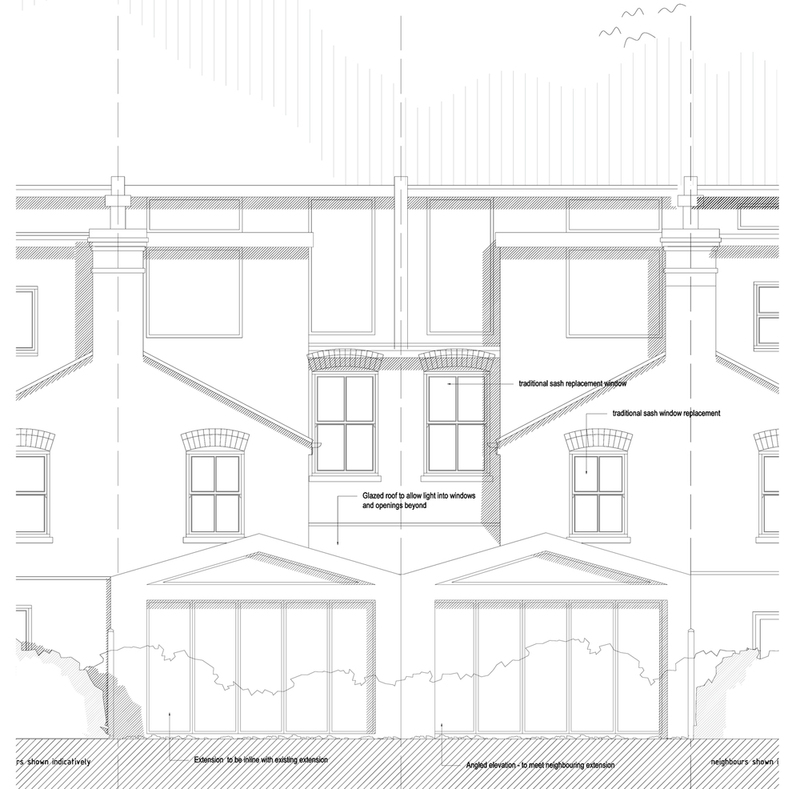 With completing a joint application, the party wall between the two properties was to be built on the boundary line, thus sharing a separating wall, added space to each proposal internally. As this was a joint application, our clients wished to do something a little different to create a design that complimented each other. 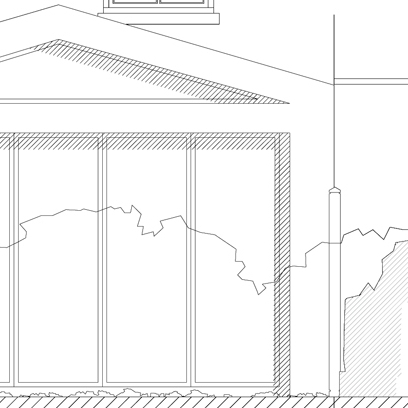 A pitched roof single storey extension was proposed to both properties with a central spine wall with hidden gutter. The site forms one of the first developments on the Hydethorpe estate. During the middle ages it formed part of a plot of 60 acres, passing to various owners it was eventually sold to Emmanuel Cambridge in circa 1589. The area was developed in 1896 starting with Hydethorpe Road, The quality of the buildings in the planned development, with open land - such as tooting bec common, has made this a popular area to live, and therefore highly sort after. The housing is Edwardian in style all being two stories in height and having angled double storey front bays with internal Porches. The Frontages are just over 3m in length and are edged with short boundary walls, hedges and often both, to give height to the boundary. Flemish bond red brick is used to the front of all houses, aside from those painted or rendered in soft subtle colours. A subtle grey and cream have been used on the proposed site. Stone dressing details which include centre arch with Keystone to the entrance corbels under projecting first floor stone sill, and pedestal and column detail to bay windows have all been painted white. All the Front Edwardian Features contribute positively to the character and appearance of the area with quality architectural detail. Ground Floor windows are traditional sash with a high cross bar and additional glazing bars on the upper part of the sash. First floor windows are usually split. These have been replaced with Aluminium windows to one of the proposed houses, but the original design shall be re-introduced with the same traditional sash as part of the alterations. The majority of the properties have now developed their loft with a flat roof dormer extension that extends the full rear half of the roof, as as a second floor extension over the rear building gable roof. This is usually built up the further extent of the firs chimney breast allowing for a set back from the second set back from the second chimney to this projecting gable , to allow the original house shape to be retained. In contrast to the front elevation stone dealing and Flemish bond red brick, the rear elevation has again Flemish bond but yellow buff brick, accented with the more modest yet still imposing solder over header, red brick arches to the windows and doors. Replacement of the aluminium windows shall be continued and the existing balcony and door will be removed to be removed to re-introduce an original style sash window. The external balcony shall be removed and the angels proposed roof shall prevent this use. At second floor the roof will be extended in the same way as others along the street, only going to the extent of the first chimney to maintain the balance of the gable roofs, and to maintain the original features’ hierarchy. The street has demonstrated a limited pallet, which our proposal shall be built from. The loft conversion to 111 will be extended to the proposed raised parapet wall between the two properties. 109 will extend the loft space in the same manner, and shall utilise slate tile hanging to maintain the limited palette of materials that have been used on the properties. 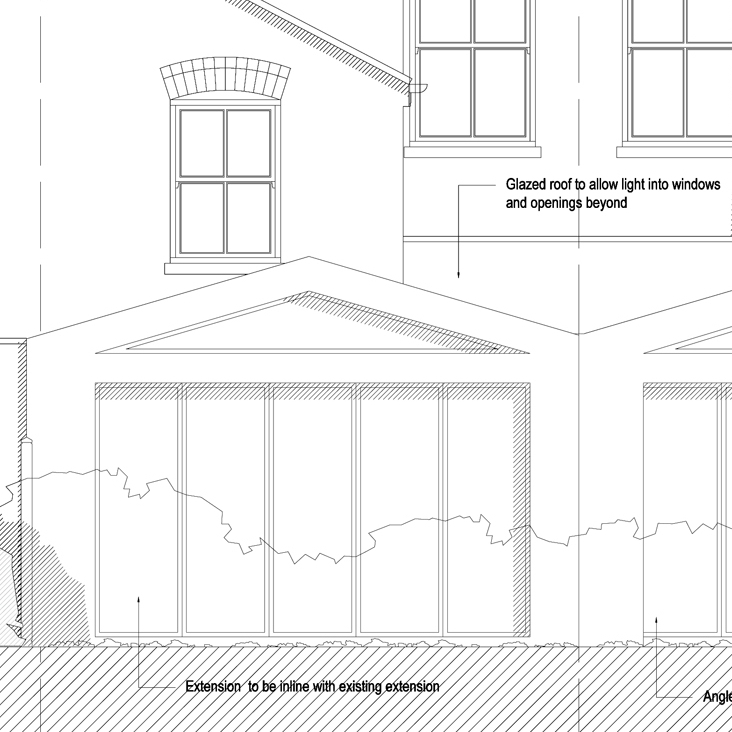 The existing rear ground floor extension on 111 Hydethorpe Road will be extended to the left to meet the new party wall between the two properties. The proposed extension will be in the same line of the existing extension, and therefore will not materially alter the aspect and outlook of its neighbours . We have proposed an angle to the one property to minimise impact on the neighbour, it also allows the elevation to face the evening sun. The loft conversion shall house the Master Bedroom and En-suite for the properties, with a flat roof extension to maximise the space to the rear as the surrounding houses have done. An additional three conservation roof lights shall be added to the front of the property which shall be fitted flush with the line of the property, to not detract from the line of the roof. Care has been taken to preserve as well as reinstate the important features, in order to maintain the character of the local area. The material choice has been chosen from the limited palette of the area, with rendered rear ground floor extension and slate hanging to the second floor bedroom and loft conversion. The whole is designed to be in keeping with buildings in the vicinity. The combined proposal is very similar to schemes that have been approved and constructed in the past and we feel this is a positive addition to the area. Posted on September 3, 2013 by Ben Mainwood.